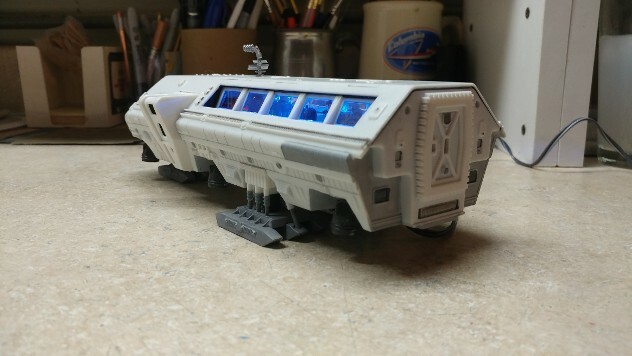 Original Aurora Plastics Clavius Moon Bus from "2001"
This is an original release Aurora kit, and it is the last original 2001 kit that I still have. It has gone through a number of repairs and touch-ups, but it is still "intact." 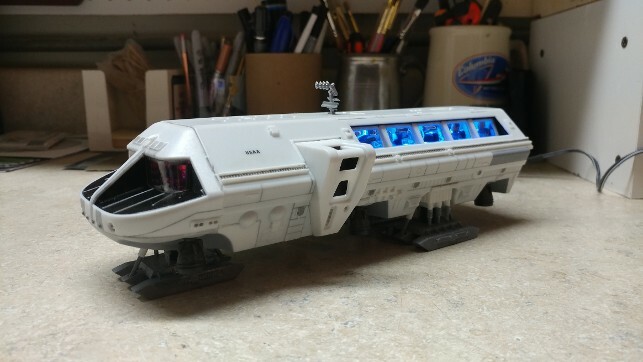 Recently, we decided to use some of the ParaGrafix EZ LED strips to give the Moon Bus a new lease on life, and make it look more like it did in the film. At the same time, we re-painted the landing gear, body detail and rocket motors to improve the overall detail. 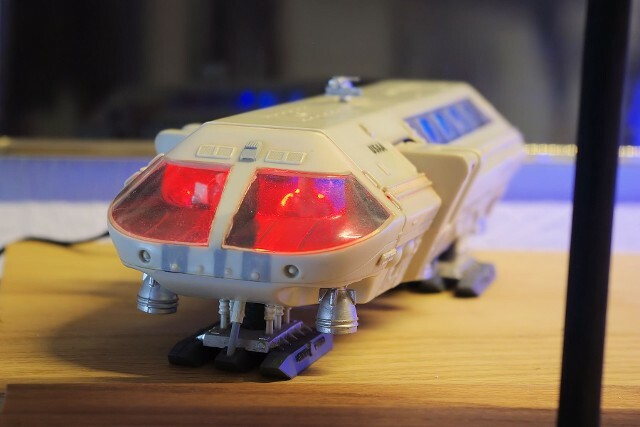 The original Moon Bus, with a scratch-built replacement antenna on top to replace the original, lost some time ago. 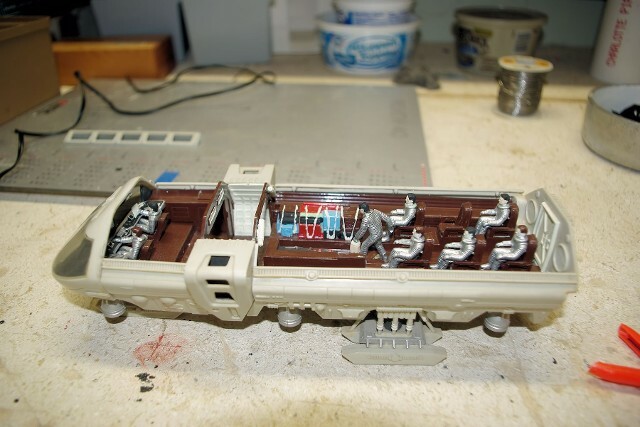 The top of the model was designed to be removable, in order to see the interior detail. I did not want to loose this capability in order to add lighting. 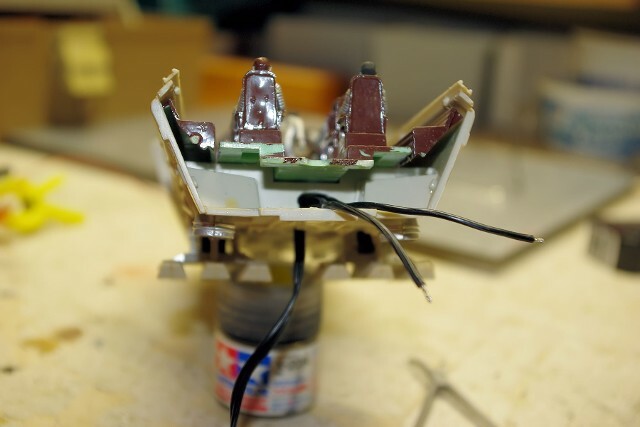 I removed the rear bulkhead and found a location to thread a wire through to get power to the underside of the roof. 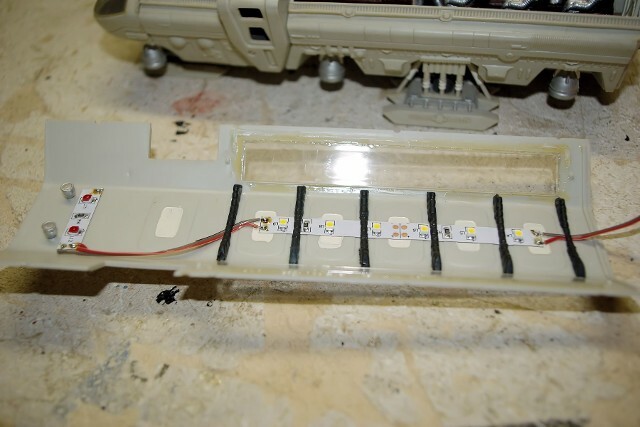 The window boxes along the sides were removed and the overhead padded beam were removed and a shallow notch was filed into each one so that the EZ LED strip could be laid down and the beams placed back over them. 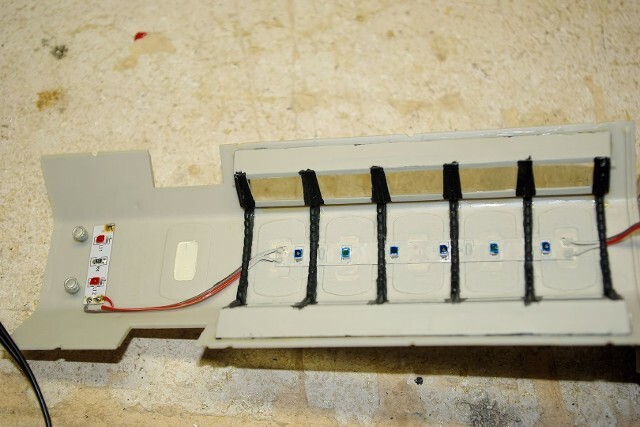 A six LED string was used for the main section and a two-LED section was made by shorting the connection for the third LED in that set to close the circuit. The two-LED segment was used in the cockpit. 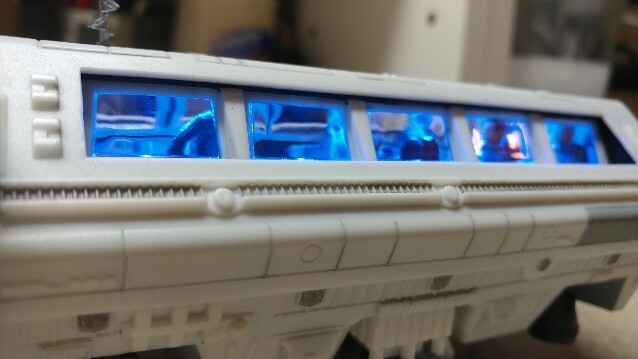 The side window boxes were put back in, and the LEDs were painted with clear blue acrylic for the rear and clear red acrylic for the cockpit. New painted details were done to the landing gear, as well as other locations. Back together, with interior lights up and running. As many of you who visit the Space Port know, we just cannot leave some things alone. 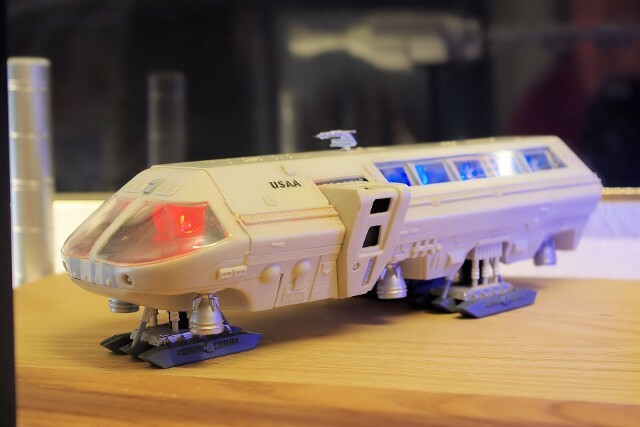 The Moon Bus proved to be no exception and we recently did a new build, using a recently released kit from Moebius Models, which has done a fantastic job resurrecting the Aurora 2001 model kits, while providing improvements to detail and construction quality. 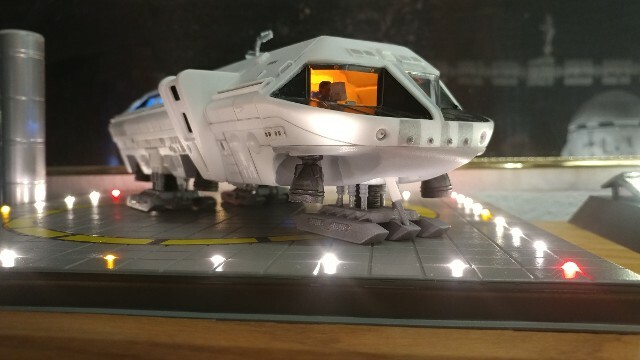 The new Moebius version has front windows which are accurately set back square to cockpit, as well as very good molding qualities throughout. A look into the red-lighted cockpit. The use of red lights allowed the crew to maintain their "night-vision" acuity. Kubrick was a master for scientific accuracy. 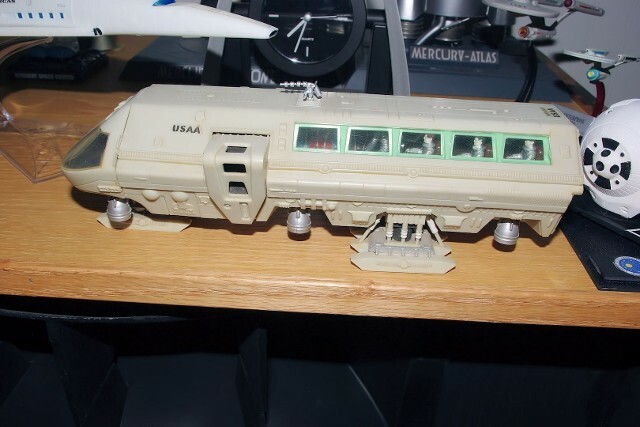 Moebius also re-did the side windows to make them accurately depict the movie Moon Bus as well. The blue lighting of the interior was patterned from the actual movie scenes. A rear three-quarter view, showing improved aft bulkhead detailing of the Moebius kit. 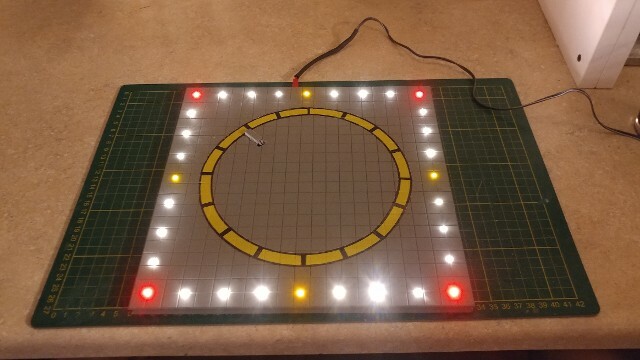 Next, we decided to create a new display base, made to look like the TMA-1 site landing pad. 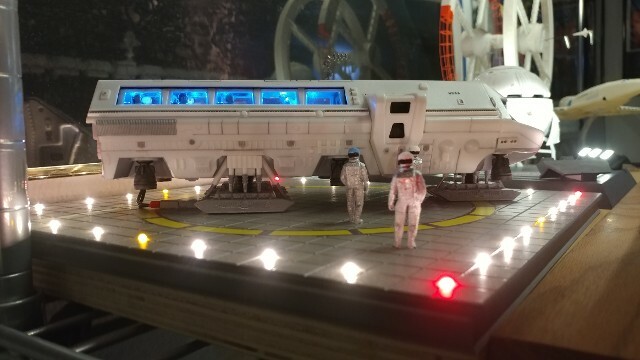 I had to build the landing pad "shrunken-down" a bit from the actual movie size, in order to fit the limite space on our display shelf. 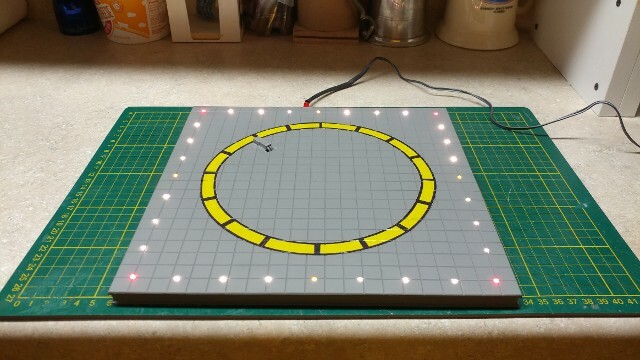 We did do LED perimeter lighting and created a custom "landing circle" decal to go into the surface. 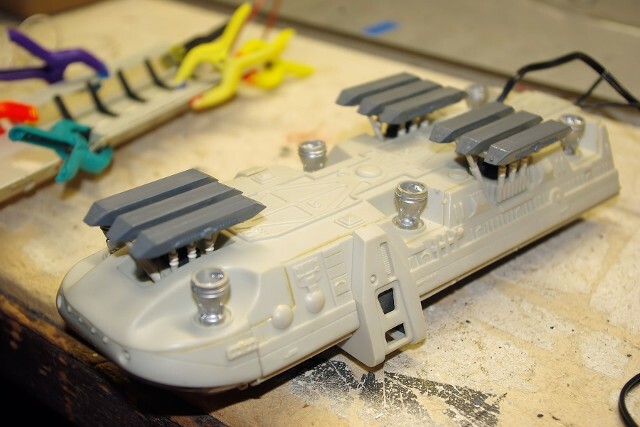 The base power socket, mounted to the pad surface below the bus, connects to the LED power cable coming out from the Moon Bus model, in order to be as inobvious as possible. 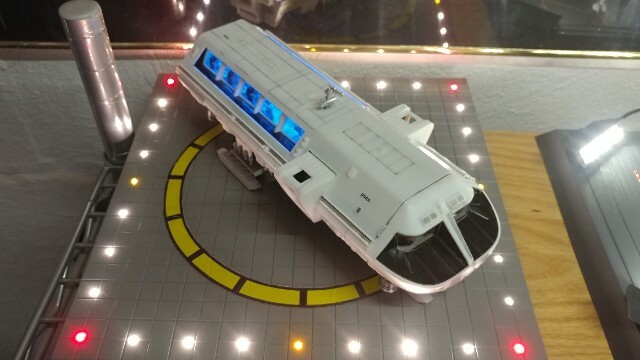 The Moon Bus is shown "hard-down" at TMA-1. Time for Dr. Floyd and his party to disembark and go "touch the infinite." 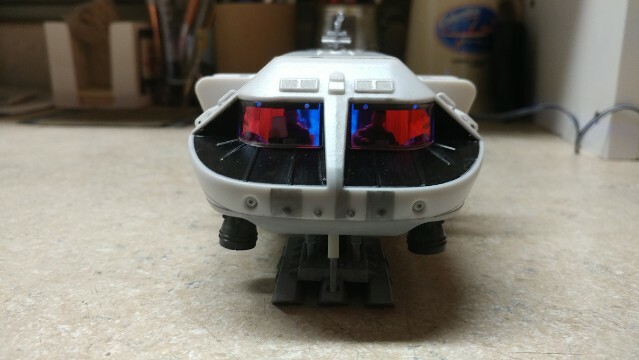 We recently added 1/55 scale 2001 spacesuited figures, obtained from the Max Gurter's "Small Statues" collection on Shapeways.com, to appear as the "ground crew" for the vehicle.